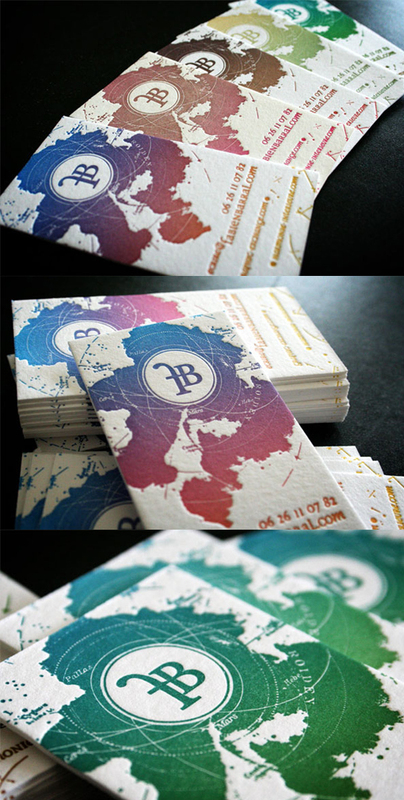 Fabien Barral designs a new business card for himself every year, just to keep things fresh and to show his skills as a graphic designer. Here's one of his designs, which shows his particular eclectic style. The graphic that he designed for the cards suited letterpress particularly well and since he had a good relationship with a letterpress printing studio he had used on more than a few occasions he was able to get them to experiment a little with colour when printing the cards. An inking process called 'split fountain' inking was used, where two or more colours are mixed directly during the printing process to create beautiful colour gradients. The process is quite serendipitous - some colour combinations simply don't go well together but when it works the results are divine. Ultimately Fabien ended up with a set of cards where each one is unique in the combination and grading of colours.